EDITOR'S NOTE: Earlier today, Gov. Malloy vetoed the bi-partisan budget passed earlier this month. Tomorrow, Senator Fasano weighs in on that. In the wee hours of the morning on Saturday, September 16, 2017, the democratically controlled Connecticut House of Representatives passed a Republican budget plan – an historic event and one that unquestionably changes the power structure at our state’s capitol. This budget is essentially the same budget plan Republicans have been offering since April. It includes no new or increased taxes, fully funds education aid to our towns to avoid inevitable property tax hikes, and structural policy changes to how our state’s finances are managed, including spending and bond caps, mandate relief, and a realization that we need to stop spending more than Connecticut taxpayers can afford. The alternative would have been a budget offered by Governor Malloy and Democrat leaders that included more than $3 billion in new spending and taxes over the next biennium - taxes on hospitals, real estate, e-cigs, cell phones, fantasy sports, personal property taxes, a surcharge on home insurance policies, and reductions to town aid that would have cost taxpayers millions in new local property taxes. For someone who has served in the minority for seven years, I cannot tell you how remarkable this turn of events is. For months, the Speaker of the House and the Governor, who control the legislative agenda and decide when and how we even get to debate a budget, have been blocking Republicans’ ability to even have a proper debate in the legislature on our version of how to manage the state’s finances. On Friday afternoon, September 15th, three Senate Democrats shocked everyone when they crossed over and voted for the Republican budget plan leaving Democrat leaders, the press, and onlookers in amazement. Clearly, the pressure has been mounting on them to push back on the tax-and-spend business as usual policies offered by their leadership. The budget passed out of the Senate 21-15. Immediately after, it seemed as if the House Speaker would simply block an attempt to pass the bill in the House, but after months of criticism for lack of action, he allowed the process to move forward. Around 3 a.m. the following morning, after an arduous debate where Democratic leaders filibustered and attempted to scuttle the budget bill by forcing hard votes on amendments that would have effectively killed the legislation, six Democrats in the House joined my Republican colleagues and I, and passed the Republican budget in both chambers. The bill now goes to Governor Malloy for his signature who has already threatened a veto. The fate of Connecticut is now in the hands of a governor who twice signed damaging spending and tax increases into law, the largest in state history, and is unarguably responsible for the incomparable damage done to our state’s economy and reputation as a place to live, run a business, or retire. Governor Malloy should recognize the significance of this vote and sign this budget into law. 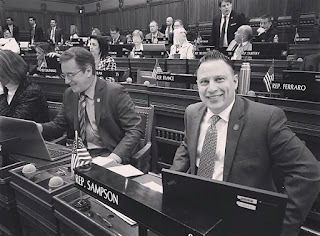 A veto would not only be irresponsible with regard to the future financial prosperity of Connecticut, but also a direct affront to the will of the people whose representatives have now spoken.